I made this Cricut Mother's Day card using the Stamping Solutions cartridge. Scraps of solid cardstock for title background, words, dragonfly, and flower. 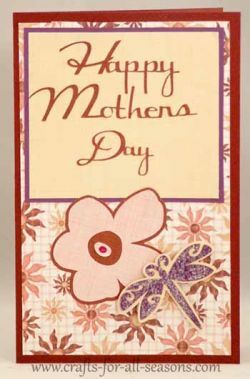 Card is 8.5" x 5.5"
Lyrical Letters cut file is used for "Happy Mother's Day"
1. Fold a 8.5" x 11" of cardstock in half to create a 8.5" x 5.5" card. This will be the card base. 2. Cut a patterned sheet of paper 5" x 8" and glue it on top of the front of the card. 3. Cut two pieces of cardstock to make the rectangle where the words "Happy Mother's Day" appears. The bigger rectangle is 4 1/4" by 4 3/4". The smaller rectangle is 4" x 4 1/2". Glue these on top of one another, and then to the top portion of the front of the card. 4. I used the Cricut Design Studio and Lyrical Letters to cut out "Happy Mother's Day". It was cut using the feature "connected" and I used the software to kern and weld the letters together. The title ends up being 4" long by 3.5" tall. If you own Cricut Design Studio and the Lyrical Letters cartridge and would like to download the cut file, please click here (you will need to unzip the file). If this is not working for you, please let me know by contacting me so I can fix any problems. 5. Load the Stamping Solutions cartridge. Using the color cardstock of your choice, select "shift" then the "please come" button (button 20) to select the flower. Select 3". Press "cut". 6. Load in a contrasting color and select "repeat last" and then also hit "shadow". Select "cut". This will make a flower with a slightly bigger shape for the background. Glue the smaller flower on top of the big one. I also enhanced the middle of the flower with a dot of glitter glue. 7. For the dragonfly, load in the color of your choice (I used purple). Select "shift" then "missing you" (button 3). Select size 2". Press "cut". Then load the color for the background, and select "repeat last" then select "shadow". Press "cut". Before gluing the dragonfly to the background, I first applied glue to the purple dragonfly and sprinkled it with glitter for extra sparkle. After it was dry I glued the dragonfly to its shadow. The dragonfly was then glued below but overlapping the flower.